For the last few Fridays, I’ve explained a bit more about the real things of what my businesses want. I’ve shared things like — What I’ve done wrong? What I’ve learned? What I’ve done right? This time, we are going to chat about lead magnets. 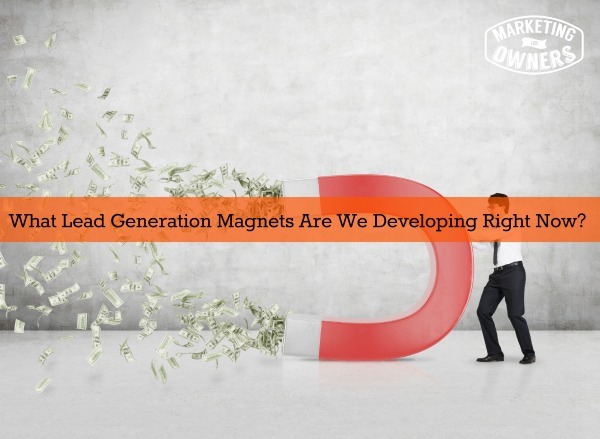 A lot of people get stumped on creating a lead generation magnet. It’s really easy but sounds complicated — The generation step 3 of the five-piece process of modern marketing. It’s the permission part, where we ask the customer for permission to market to them. What you do in effect is you give them something, generally for free, in exchange for the contact details and an exchange for being allowed to talk to them through email, etc. Marketing to them, doesn’t instantly mean throwing Office at them. We are going to start to build trust and a relationship with them first before we try to sell them anything. I have a number of businesses(not quite Richard Branson) but my businesses are generally working on lead magnets and revealing them. One of my businesses deal in the beauty industry. We are just tweaking the end of a report that is a consumer guide. Now that consumer guide is for the trade to explain what to look for when you’re looking for the product that we happen to offer. It’s an independently written consumer guide. We offer all of the pros and cons of process and minuses and such. It does not try to sell our products over and over through the pages of this guide. This is a genuine guide that is good for the customer. Now, the next product guide we are making will be a guide for the consumer or the end-user. So — we will have two guides to offer — one for the trade community that is offering our services and products, and then one to the consumer, that is the next one we will produce. At that point, we will then have two different landing pages that target to different types of audience and to different potential customers, to different avatars for owners. Count on the same device, people. In the fire safety business that I own, we also have a consumer guide. (Here’s a hint — consumer guides are very popular because, that information gets the attention of the customer because it offers authority in the industry.) So, we are creating a consumer guide on what to account for when choosing a fire extinguisher or fire safety maintenance. That is going to teach you how to save money, how to get it done right, how to make sure they comply regulations etc. So, it is genuine information and by coming from us, it imposes that we do it right, which we do but it is not a selling tool. This is not for selling the product, it is to give information to staff to build trust and a relationship. We want them to know like and trust this. We have another report that we off that is based on the different cycles of the trades. Say, for example, what fire safety would recommend for a hotel? What fire safety would be good for the home? Build a home fire safety plan, things like this. There are numerous once we create on how we are doing. Now, in this business trade, you will be pleased to know that we are right in the middle of creating a free course. This is a free two week live course that you can get through the membership portion of the Marketing for Owners “Owner’s Club” website. Within that, we will take you from the entire process from start to finish of what we teach in five pieces of modern marketing. Everything you need to know from start to finish — for free. And yes — a free membership is a lead magnet. We are also working on a tools guide because we use a number of particular tools in the business software. Generally they’re free in our businesses and we use them constantly everyday. These are the very tools that we use to build up over 97,000 customers in my businesses that are paying customers. There are no sales, no people to cold call, no outgoing salesmen in this process, and you can, too, that’s what the whole thing does. 1. 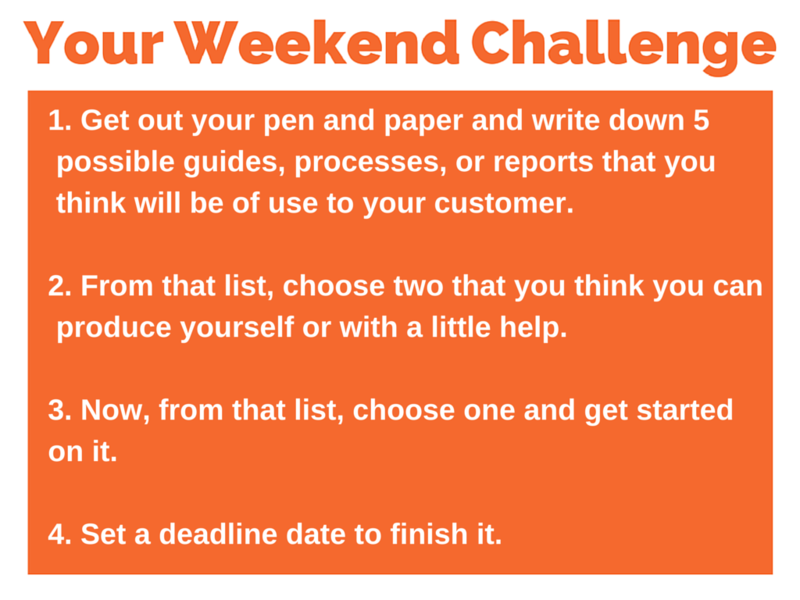 Grab your pen and paper and write down 5 possible guides, processes, or reports that you think will be of use to your customer. Do not worry about whether you know how to produce them. Just think of what would be useful. Perhaps it could be something someone else sells, that you could offer for free. 2. From that list, choose two that you think you can produce yourself or with a little help. 3. Now, from that list of two, choose one and get started on it. 4. Set a deadline date to finish it. 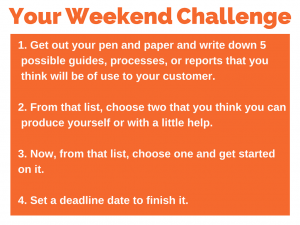 That’s it — the weekend challenge is done! You’re moving up the game my friend. You are going to be wealthy. What kind of guide or process will you offer your customers?